livestock for its flavor and good price. For any kind of holiday season for the Pinoy, pork roast, pork adobo, pork tapa and bacon strips or jerky are staples for celebrations, and it is high time that we look at wild boar meat, or baboy ramo pork as a healthy alternative to industrial farm production pork. 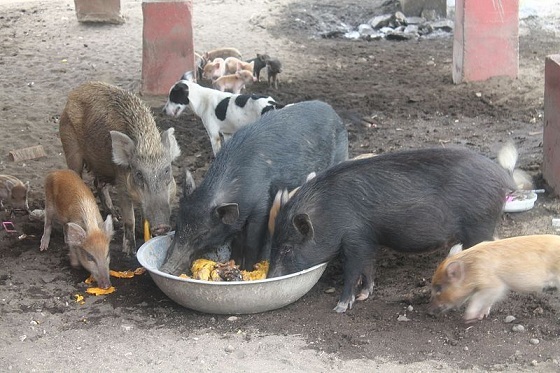 Many enterprising local farmers have started their own native baboy ramo free range backyard brood by buying stocks of female baboy ramo from wild boar stock breeders, one stud boar to two sows. Some cross a native black pig with a wild boar to domesticate the breed for a less feral breed, but the pure hairy baboy ramo already has its own fairly domesticated breeds running among current local wild boar sellers that you can get the pure breeds without worrying about the pigs hurting humans or behaving like the jungle feral variety. The jungle baboy ramo breeds are instinctively aggressive and will jump out of a waist-high fence and may be more difficult to maintain if hostile around people. Rest assured, you can find both half-breeds and domesticated hairy breeds of wild boar that are fit for local free range backyard farms. Local wild boar breeds tend to be a lot smaller than the off-white skinned commercial swine breeds but its meat sells really well to wild boar enthusiasts and gourmet cooks for up to P250 to P300 a kilo for dressed meat, and higher if offered as organic baboy ramo pork. Local baboy ramo is popularly also used for lechon de leche for fare in fiestas and celebrations and the meat is also used for special roast pork recipes among Manila Chinese restaurants that serve wild boar on their menus. Wild boar is actually less costly to raise than commercial pigs because they just forage around a grazing area and will be gratefully content with just cogon roots. But a backyard farm should have you mixing their feed with some samak leaves or rice bran and corn grits bought in the market. Local baboy ramo are also hardier and less susceptible to common livestock diseases so you spend less on medicine that just adulterates their blood and meat with whatever residue. Free Ranging Baboy Ramo on a farm, note the hairy pigs. Wild boar sows can give six to ten piglets per litter in a shorter turnaround after getting on with your stud boar. Commercial pigs take longer but produce bigger offspring. 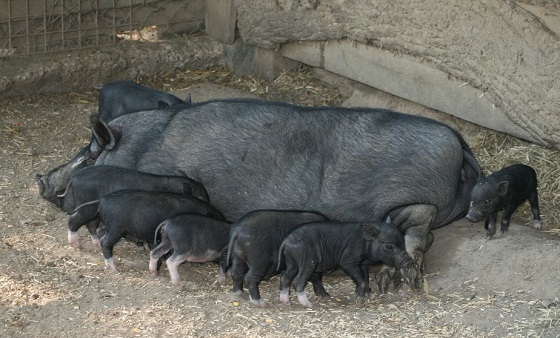 For backyard farmers for wild boar or baboy ramo in the country, you can breed a large brood in no time and earn good money all year round as a home based negosyo. The national government has been endorsing this sort of free range livestock off grid among backyard farmers with the Bureau of Agricultural Research offering a free primer for helping local breeders set up their starter pigs. Locally there are brand organic farms that offer breeder stocks as well as sell commercial quantities of the meat to local markets and food service outlets. Baboy Ramo Adobo and Tapa Anyone? In the Philippines baboy ramo recipes are a delicacy, and regarded as a rather indulgent treat whether cooked as “kaldereta” or “adobo” or “kinilaw” (marinated in vinegar and spices until the acid cooks the meat without heat). Even bacon jerky or tapang baboy ramo is a favorite treat among both Pinoy homemakers and Chinoy restos. The baboy ramo meat is leaner because the pig is more active foraging, not sitting in a commercial pig pen all day long. And it is easier to cook than other meats with the baboy ramo pork tenderizing and cooking at lower temperatures. Wild boar, baboy ramo or razorback is known in the West to take the flavor of whatever food you feed your alaga, sweeter and nutty than greasy since it is leaner than porkl with a third less fat, calories and cholesterol. If you want to pamper your baboy ramo for best flavors, feed them apples as treats, squash for a nutty flavor or just backyard leafy vegetables. European wild boars (also referred to as Russian Boars) were first introduced in Florida and then Texas between the mid-1800s to the early 1900s. Americans love their wild boar smoked, barbecued, grilled, roasted, braised, fried and, marinated in the open like cowboys in the west when they catch or trap game. Ground wild boar in some sausage preparations by German and Italian meat shops is a delicacy with aficionados who hanker for game or wild meat. 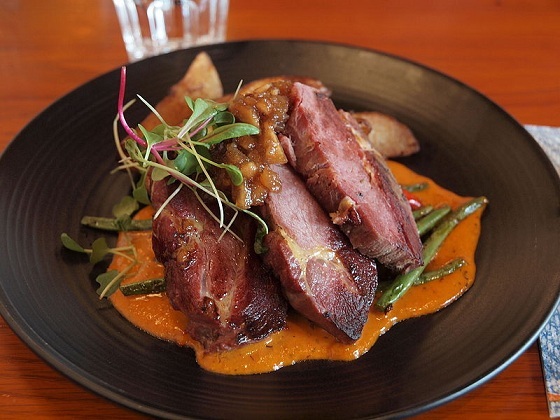 Some high end restaurants in the U.S even source their wild boar meat exclusively from organic free range farmers dedicated to wild boar to support production by specialist farmers who know their stuff. Free range pigs that forage for food tend to taste better than pigs held up all their lives in industrial farm pens. 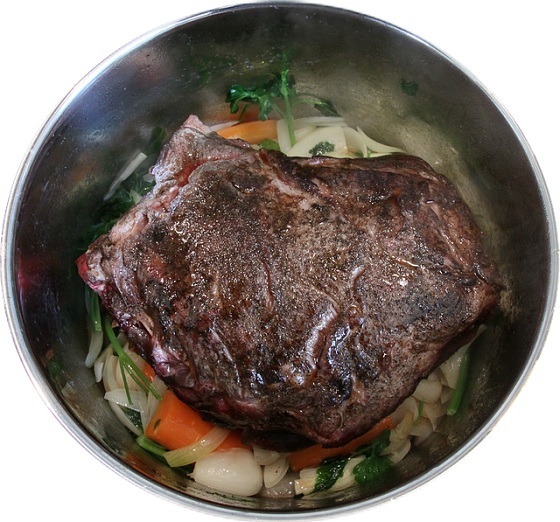 Baboy ramo grazing on a wide variety of forage consisting of both root crops, scrap veggies from your garden farm offer leaner and more flavorful meat. Farm pork from commercial farms tend to have residues of pig antibiotics and hormone supplements that may build up in your body over time and cause harmful effects that you may pass on to your offspring. This holiday season or on any holiday season, if you have to buy pork and can afford to treat yourself with something special, look for local restos, Chinese restos especially, that offer baboy ramo in all its roast pork varieties, or buy some yourself from a weekend market and cook it in your favorite pork recipe, from adobo, bacon, to tapa or any other dish. Enjoy the benefits of eating healthy without losing out on flavor with baboy ramo dishes.